Don't worry. Be happy. Keep learning. : Wonderfully Chaotic Featured Friday. I recently joined a group on Facebook for northern Indiana women bloggers. 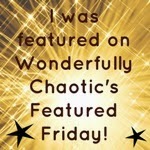 After introducing myself to the group, I found a fellow blogger named Shay who posted about her Featured Friday. She features other bloggers and showcases their blogs on her blog on Fridays. I told her I was interested, so she sent me some questions . . .
Head over to her blog today to check out my answers to her questions! Her blog is titled Wonderfully Chaotic. Go show her some love! at 4:00 AM Topics: Blog.